I am preparing for a book-event trip that includes a stop in New London, Connecticut, my home town. When I give a talk, besides talking generally about Julia Wilbur, freedpeople, Alexandria, and the other main subjects of my book, I like to find something specific about where I will be. 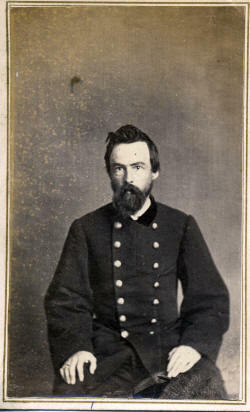 Bentley enlisted in the Fourth Connecticut Infantry in June 1861 as an assistant surgeon. By September 1862, he oversaw one of three divisions of Union hospitals in Alexandria. In 1864, his responsibilities included L'Overture Hospital, established for African American and Native American soldiers. There, Julia Wilbur frequently had contact with him. After the war, Bentley remained in the Army in Washington, where he was the first professor of anatomy at Howard University, and in California. In 1878, when he moved to Arkansas, he was one of the co-founders of the University of Arkansas for Medical Sciences. What about the body parts? Last year, when I searched for more background about Bentley, I came upon this item from a newspaper in Sacramento, reprinted from the Norwich Bulletin. There was an administrator's sale of personal effects at the former residence of the late Thos. Norris on Saturday, In the schedule of property, as appraised, was the following item: One fifteen gallon keg, contents unknown, 75 cents. No one seemed disposed to purchase the keg, and it was taken at the appraisal by John it. Dorrance & Co.. and, with other purchased articles, carried to the place of business of the firm. Dorrance started the bung ["a stopper for closing a hole in a container"], and was unable to tell what fluid the keg contained. Thinking that all the value was in the keg itself, the fluid was allowed to run out on the ground, and the keg remained bung down for several hours in front of the store. When about closing the store for the night, the clerk tried to roll in the keg in question, as well as other packages, and was astonished to find that, from its weight, there was still something in it. To gratify his curiosity he procured a hammer and burst in the head. To his astonishment a human hand and arm protruded. Without waiting for further developments, he fled in terror, and told every one where could be found tho cause of ins fright. The news soon attracted a large crowd, and the contents of the package were still further examined. Other arms, hands and legs, and two ghastly heads, were discovered. Here was a mystery of startling proportions. Who could be the horrid monster who had committed such a crime and then so easily disposed of the evidences of it? And in Norwich? Ugh ! Where were the authorities? Crowds rushed to the scene of the discovery, and Market and adjacent Streets presented an unusual appearance. It soon came to the ears of some of the physicians in town, and they hurried to the scene of the excitement and solved the mystery. One of them recollected that the house of Norris was the property and the former residence of Dr. Edwin Bentley, an eminent surgeon, who served during the war, and is now a brigade surgeon in the regular army, and is at Washington. The Doctor had sent home numerous amputated limbs where the operation possessed a scientific interest, and they had been stored temporarily in the cellar of his former dwelling. The keg in question had been included by mistake in the effects of the late resident, and hence the development, and the short-lived sensation.